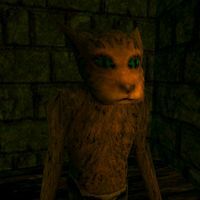 Joto is a Khajiit Acolyte of the Mage's Guild, currently imprisoned in the Jail. He had assisted Iszara in her attempts to restore Prince A'tor, which may have led to his arrest. Avik, a retired guild member, is one of his friends and Joto used to update him on guild politics. Iszara asked him for help in releasing A'tor's soul from the soul gem, but he could not help her. She decided to seek out N'Gasta; Joto warned not to trust him, but Iszara ignored the advice. He insisted that she find the Flask of Lillandril to protect against the necromancer's magic. In their search they found a piece of the map, but lacking patience Iszara gave up on locating the flask and went to the Isle of N'Gasta anyway. After Jaganvir turns Cyrus into a gremlin, you must find someone with the knowledge to reverse the spell. In this form, you can enter the Jail through the window just right of the main door. Joto is up the stairs in the cell farthest south. If you correctly sound out the words "change me back", he will recognize and undo the Archmage's spell. He briefly recounts his interactions with Iszara and thinks N'Gasta has her now. Most importantly, he gives you the map piece they found while searching for the flask. Dram suddenly appears at the end of the hallway and kills Joto with an arrow. According to the game files, Joto was originally named Tirbinwell. "Well. What have we here?" "A gremlin? Come here, little one." "You want something? From Joto?" "Sorry, Joto can't understand you." "This means nothing to Joto." This page was last modified on 4 August 2018, at 08:13.